These articulating seats allow marine police officers three different seating solutions in one very clean versatile package,” said Todd Salus Ocean Craft marine Vice President of Sales and Marketing.” …In just seconds, and while underway, officers can articulate the seating positions to operate the vessel from either a fully-seated position, a leaning and semi-bolstered position, or a fully-standing, fully-bolstered position as the prevailing conditions and patrol environments may necessitate,” continued Salus. 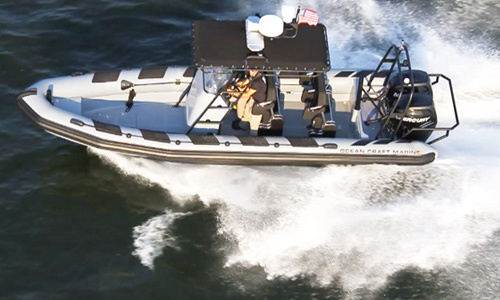 Maritime law enforcement officers need to know the our OCM 8.0LE is designed and constructed to meet the same exacting, rugged standards as our military boats, far beyond that of most commercially available RHIBS,” said Todd Salus. Whether your department’s need is fishery enforcement, harbor security and enforcement patrols or tactical team interdiction the OCM 8.0LE has the mission covered. The OCM 8.0LE is available with many electronic options to include a fully-integrated, wireless crew communication system and fully articulating, thermal imaging camera system with recording capability. “The 8.0LE features an onboard battery-bank charger and conditioner so that it is always ready to get underway as well as four integrated lifting hard-points for landslide hoisting, shipboard use or transport by rotary wing aircraft. To arrange your private product demonstration,contact the Ocean Craft Marine Team, located on the water in Annapolis, MD.